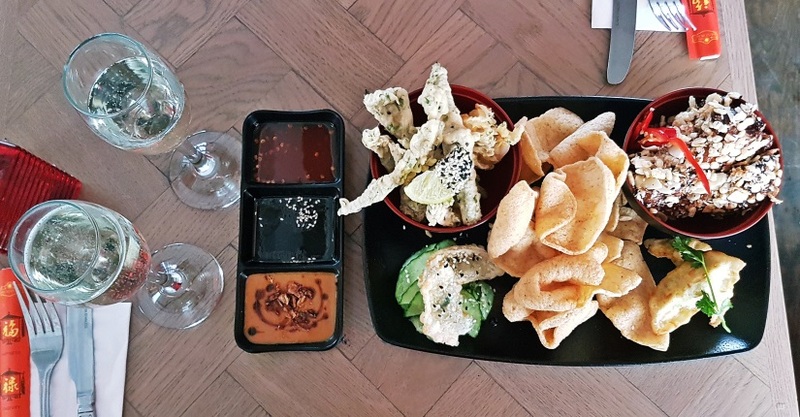 Tempura, noodles, and more prosecco than you could reasonably drink? Check, check and check: that’s what Bar Soba’s Bottomless Lunch is. And doesn’t it sound awesome? In the run up to my Megagame, TC has been the height of helpful. He came up with some great ideas that made my game even better, he proof-read all my briefings, and on the day itself he served as the Mad King (and did so excellently, FYI). In return, I promised to treat him to a proper date. I’ve been dying to try out something “bottomless” for ages. Bottomless brunches are the big trend, of course. But most of them are weekend-only, and our weekends are booked up for the next couple of months. I first heard of Bar Soba at the Cocktails in the City event. My friend tried their “Hemingway’s Hong Kong Honeymoon” cocktail, and it’s probably the cocktail I most regret not ordering on the night. I’d kept TC in the dark about where exactly we were going, only telling him we were a) going somewhere new and b) it was on Merrion Street. Since we live over near Leeds Dock, we don’t often head over Merrion way much, so this really didn’t narrow it down at all. Heading past the Grand Arcade, I was reminded that there’s lots of good reasons to make the short walk over that way. I’m dying to try out the new Ham & Friends (being a big fan of the original). I’ve heard tons of good things about the new Domino Club. And Zaap Thai, which I finally managed to try last month, does such amazing Oriental street food – though it always seems to be heaving. To be honest, my first impressions of Bar Soba weren’t amazing. The downstairs is a little dingy, like the feeling you get when you go to a nightspot during the day time… which to be fair, is exactly what it is. Bar Soba is just that, a bar! Under low lighting and with a few cocktails inside you, I’m sure it would have been fine, but at 12noon precisely, it was a bit of a shock to the system. The upstairs couldn’t have been more different. This bar was bathed in light, due to the giant skylights in the ceiling. If downstairs was spot on for dancing the night away, upstairs was perfect for an early summer lunch. We were greeted enthusiastically by our server, Ryan, who explained to us how the Bottomless Lunch worked. For £25 each, we would share a platter of starters. This would be followed by one from a choice of main courses. Ryan fetched the Prosecco bottle to get us started while we perused the menu. After ordering our food, we had time to chat a little over glasses of Prosecco. I revealed the rest of the plan for the day (Guardians of the Galaxy was as much of a hit as I’d thought it would be), and we talked about our plans for running yet more megagames. The standout item for me was the “Bang Bang Chicken Wings” (in the top right). These were spicy chicken wings coated in rice crispies – definitely unusual, definitely delicious. We also had chicken gyoza, vegetable gyoza, and a pile of tempera that included prawn and various veg. Plus the Indonesian Shrimp Crackers were much nicer than the prawn crackers you get with your Chinese takeout. We’d only been at the restaurant for about half an hour by the time we finished the platter, so we asked for a bit of time before receiving the mains, which they were more than happy to accommodate. Out of the five options, TC and I both wanted the same two, so we did what we normally do, and decided to halves them. And then forgot to swap dishes because we were both enjoying the one we got. Despite the similar looking pictures, the dishes were pretty different – I had thin noodles rather than thick, plus a lot more different meats, and the seasonings were different too. I stuck to my good old Prosecco the whole way through the meal, and by the end I was feeling a little tipsy. TC, however, changed it up. The bottomless menu also included bottomless mojitos and – the one TC went for – Apple and Ginger Mojitos. The staff were super attentive to us during our visit – not in an annoying way, but in a “get as many drinks as possible” kind of way. Bar Soba Bottomless Lunch is available Friday, Saturday and Sunday for £25 per person.